Fellow 500 Home Run Club member Ted Williams once said "They invented the All-Star Game for Willie Mays.” And there is no doubt that Mays deserved each and every nomination to baseball’s grandest stage. 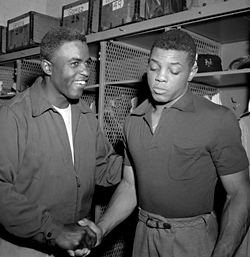 No one played in more Major League All-Star games than Willie Mays, who appeared in 24 consecutive Mid-Summer Classics from 1954 to 1973. 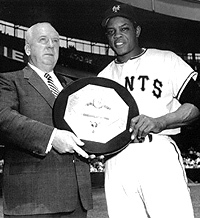 The first MLB player to ever hit 30 or more home runs before the All-Star break (with 31 prior to the 1954 inter-league contest), “Say Hey” Willie Mays was made for primetime. In obvious agreement, Major League Baseball saluted Willie prior to the 1997 All-Star contest with an all-out celebration of his lifetime achievements and contributions to America’s Game. 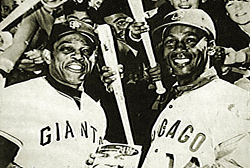 One of Willie’s proudest and most memorable moments came in 1954, when his New York Giants bested Jackie Robinson and the Brooklyn Dodgers for the World Series crown. Mays never shied away from the glare of the All-Star spotlight. In 1968 in Houston during a season when pitchers dominated hitters, Mays built the only run of the game when he led off the first inning with a single, took second on an error, went to third on a wild pitch and scored on a double-play grounder. At 37, he earned his second All-Star Game Most Valuable Player award. Five seasons earlier, Mays drove in two runs and scored two others and was the M.V.P. in the National League’s 5-3 victory.